From the Rideau Canal, the 10km Tay Canal winds up the Tay River, through the Tay Marsh at the Perth Wildlife Reserve, and into the Tay River Basin in Perth. It is accessible from the Rideau Canal is by locking through the Beveridges Locks into the Tay Canal. 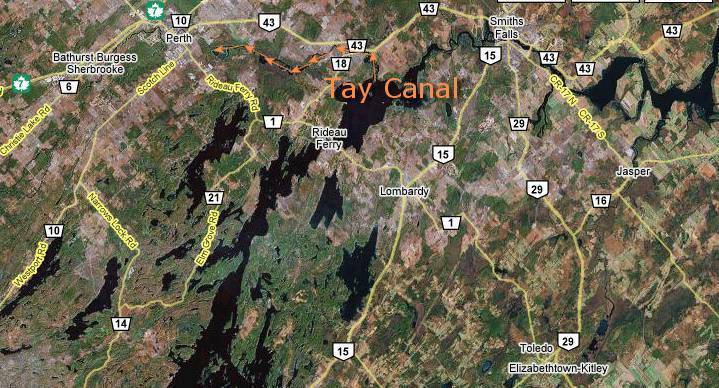 Check with Parks Canada before navigating up the Tay Canal for current draught, but the draught in the Tay Canal should be maintained the same as for the rest of the Rideau system. Do You need a navigation chart? Yes - two sets of navigation charts cover the Rideau. (Chart 1512 from Ottawa to Smiths Falls and Chart 1513 Smiths Falls to Kingston.) These charts show the depth of the water in all the lakes and rivers, and clearly show the navigation channel with all the marker buoys. These charts can be purchased at most lock-stations or can be ordered by phone 1-800-324-6052 or on-line from Ontario Travel Guides. 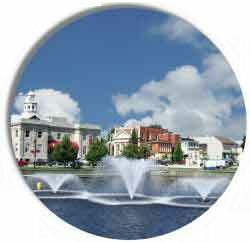 Downtown Perth can be reached from the Rideau Canal system via the Tay Canal, teminating at the Tay Basin. Large boats will find they cannot get any further than the Last Duel Park (where they can dock) because of very low bridges. Small boats should be able to navigate under these bridges and into the Tay Basin where there are docking facilities. Beyond the Basin, the Tay River continues through the Tay Valley Township, offering some of the best paddling and wild-life viewing in the region. Following the War of 1812 - 1814 between Great Britain and the United States a survey of what became the Rideau Canal was carried out to establish an alternative route between Montreal and the Great Lakes. To this end, Lieutenant-Colonel John By of the Royal Engineers was sent to oversee the task of making a series of small lakes and the Cataraqui River into a navigable waterway. Actual construction started in 1827 and the canal opened 5 years later in 1832 with 47 locks at 25 separate lock stations. The total length of the route is 202 kilometers, with about 19 kilometers being man-made, with the rest of the canal being the already existing lakes and rivers. Although it carried freight and passengers in small steamboats for almost a century, the Rideau Canal was never economically viable, and is now used entirely by pleasure craft. Today, the Rideau Canal Waterway is a boater's paradise, attracting pleasure boats from across North America to travel its 202 kilometre (125 mile) length. Entry points to the canal are; at the North end of the canal, Ottawa (Canada's capital), and at the South end, Kingston, with entry into Lake Ontario. The Rideau Canal is actually two separate river systems flowing in two separate directions. The Rideau River originates at Big Rideau Lake and flows north-east to Ottawa, with the Cataraqui River starting at Newboro Lake and flowing south-west to Kingston. The highest point of the canal is at Newboro, 180 meters above sea level. Maximum permitted dimensions of boats are 27.4 m (90 ft) length, 7.9m (26 ft) width, and 6.7m (22 ft) height. Water depth is maintained at 1.5 metres (5.0 feet) minimum. 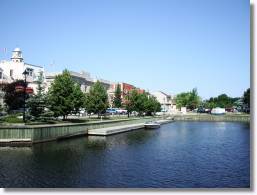 The Rideau Canal is the oldest continuously operated canal in North America. The Canal appears and operates much as it did 150 years ago with limestone locks, hand-operated cranks, wooden lock master houses, and stone supply buildings. Each lock is unique in its history and Parks Canada staff are always ready to offer the tourist any assistance they can. Most locks provide washrooms, overnight mooring and picnic facilities, including tables, benches and barbecue grills. The Canal is usually opened between May 20th and October 12th. It can be navigated in as little as three days by power boat, but this doesn't leave much time to enjoy the sights, sounds and history of one of Canada's greatest engineering marvels. The Rideau is a paddlers' paradise offering excellent flatwater paddling. Access is very easy at any of over 30 launch ramps and most lockstations. Those traveling the length of the canal have the option of "locking through" the locks or portaging past them. Those camping will find it convenient at the many campgrounds or at the lockstations. Those wishing to enjoy a more decadent trip may wish to stay in B&Bs along the route. With over 1,091 km (675 miles) of shoreline on the Rideau, there's so much to explore.